The Class of ''68. (Photo courtesy Shirley Olive). In November 1968 53 students sat for their Senior examinations at Warwick State High School. In November 2018, about half of them returned for their 50th reunion. In the weeks leading up to the occasion the classmates exchanged news, photographs and life histories via email. Peter Johnson and Eric Turner started the search for names and addresses. “I did ring a few relatives of the students still in Warwick, or who I knew, to try to track down others,” Peter said. Eric said he’d been “trying to garner interest through Facebook for about 12 months, but was disappointed in the initial response”. Most of the 1968 class have retired after following various careers and raising families. Several have died. Some have lived in Warwick for most of the 50 years while a couple of them, as young graduates, returned to teach at WSHS. Two of the former classmates married soon after leaving their school days behind. Many of the 1968 Seniors started at Warwick Intermediate School in Form 1 in 1963, the last intake to do their 7th grade there. In 1964, they were the first to enter Grade 8 instead of Form 2 in the Intermediate School. 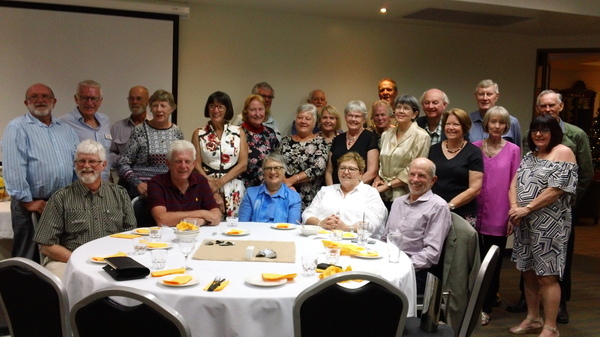 The reunion last Saturday 24 November began casually with lunch in Leslie Park, close to the swimming pool where some had excelled in the annual swimming carnivals. Afterwards the group went back to school to marvel over the changes and reminisce about the rooms where they once sat as Classes 12A1 and 12A2. Rested, refreshed and changed at various motels around town, the party met for dinner at the RSL and again for breakfast the next morning at Gardens Galore. All agreed that they had a very good time. There are no plans yet for a 60th reunion in 2028.